The Nashville Public Library offers fabulous free marionette shows. This season is a musical adaptation of James Thurber's Many Moons . A princess falls ill from "a surfeit of raspberry tarts". Only the moon will make her well. 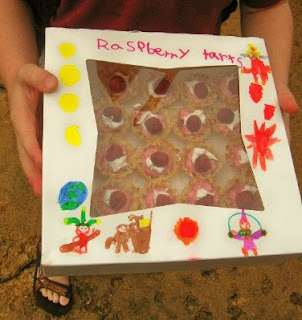 When Andrew read the book this fall, he didn't know what a raspberry tart was--much less, a surfeit of them! This time, we made some to share with the group. Fresh raspberries cost a fortune. Instead, we used 1/4 bag of frozen organic raspberries ($3 at Kroger). It was actually cheaper than preserves for flavoring the pastry cream. Of course, Andrew refused to eat one after making them. He says he no longer likes the raspberry smell! He is always begging me to bake things and then leaves 9/10ths of the finished product uneaten. We all know what happens to the leftovers if I don't give them away fast enough. Those turned out wonderfully well. Were you happy with the tiny tart pans and did you use a phyllo dough crust? When I was Andrew's age I didn't like raspberries either, but I eventually grew out of that, thank goodness. Great idea. Did you know how many kids were going to be there or did you just guess? Isn't it fun to walk in with a sweet surprise for everyone! I looked doing things like that when my son was growing up. 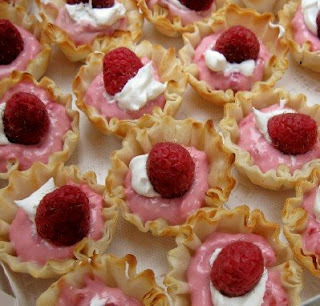 BTW, I have a super recipe for tartlet shells that is pretty easy that I would be happy to share if anyone else is in the mood for baking tarts. The filling recipe for them is also wonderful, but very time consuming (involves egg yolk added to hot filling, cooling in ice water blah blah blah)!! That book is a favorite with my little boy, too. He loves anything with big words, even though I have to explain them. They look so tasty and what a great surprise for children. Fun! I just fed my son chicken soup with rice yesterday and he thought it was so funny! Oh, the kids must have loved that! Very sweet of you to do that. Did Andrew enjoy passing them out? That is great- I wonder what was a bigger hit- the show or the treat? So cute! This is a darling idea to offer a goodie that ties in with story. Have you already been or are you going tomorrow? How did you know how many treats to make? I was justing thinking how awful it would be if you didn't have enough for everyone. I didn't bring the treats for people I don't know. This was a private group performance, and we made enough for each kid to enjoy one for dessert. Meredith they look awesome! You are such a cool mom! Those are beautiful and delicious that I wanted to lick the screen when I saw that last picture! Mmmmmm. You are a VERY cool mom! I am guessing a field trip for Andrew's kindergarten class, maybe. 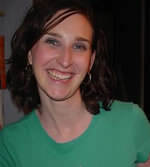 Although you may be a homeschooling mom. I don't think I remember your ever having said. Do you homeschool or does he go to a private school?